That said, sometimes you need to take a leap of faith. It’s easy to stay in your kitchen comfort zone and shy away from anything that sounds too tricky, but where’s the fun in that? This Friday just gone, one of my friends asked me to bring the dessert when we came round for dinner. (Ok, so I asked if I could bring the dessert, but she had a busy week, she loves it when I bake and I love to bake, so there wasn’t a lot of point in beating around the bush . . .). Flicking through my recipe books I found myself returning more than once to a two page spread in one of David Lebovitz’s books entitled simply ‘Marjolaine’. Having never heard of it, and with nothing to guide me (the page has no picture) except David’s rapturous description, I decided to investigate a little further. Google the word on its own and your search will return a random mixture of lingerie, recipes and women with not very many clothes on. Add in the word ‘recipe’ and you’re back on a better track. A combination of articles, interviews and a forum for chefs eventually led me back to the man who invented the marjolaine, ‘father of modern French cuisine’, Fernand Point. 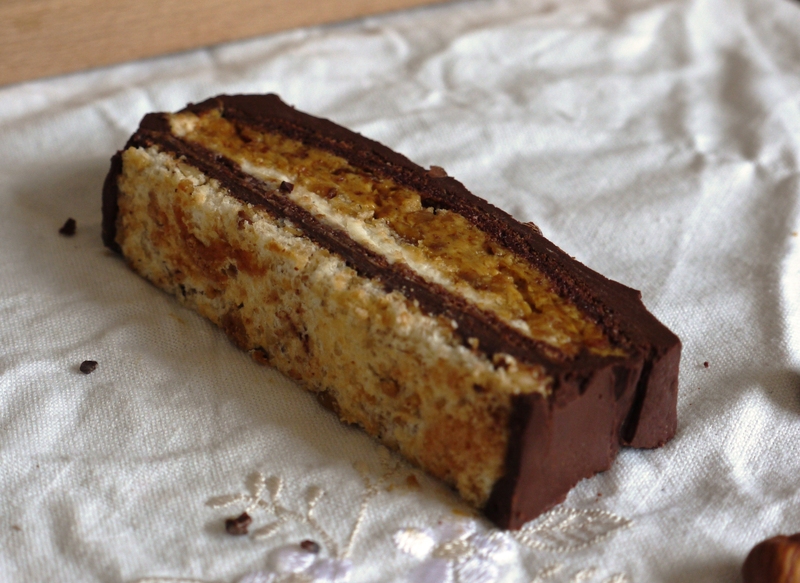 The result of ‘years of experimentation’, this many-layered, multi-stage magnificence was his signature dessert, a triumph in taste and appearance and as close to perfection as possible (which for a French chef probably means perfection itself). You might think that this, along with the fact that the instructions cover a double page spread and that I had to make it during the working week, might put me off. But seeing that the recipe could be made in stages, I decided to ignore all advice that this is a true labour of love and got stuck in, ticking off different elements as the week went on. On Tuesday I toasted my nuts and made the praline, on Wednesday I baked my meringues, on Thursday I assembled it all and on Friday I slicked over the final coating of smooth chocolate ganache before jumping in a cab round to my friend’s house. Each element involved less than twenty minutes preparation, and although it could be a little intense if you made the whole thing in one day, there’s really nothing that complicated about this recipe. As for the result? Good things definitely come to those who wait; the marriage of taste and textures in a marjolaine is simply divine. Resting the assembled dessert in the fridge overnight allows the flavours to develop and the ingredients to work with each other, creating a mouthful that moves from chewy meringue with slightly softening edges through smooth whipped cream, crunchy caramel-like praline, toasted nuts, glossy, slightly tart ganache and waves of aromatic vanilla and sweet nutty liqueur. I adapted David’s recipe to make it my own, flavouring half the meringue with chocolate, omitting some of the toasted hazelnuts and including a splash of Frangelico liqueur. In fact this dessert is infinitely adaptable, as shown by the numerous students of Point’s who have created their own interpretations. 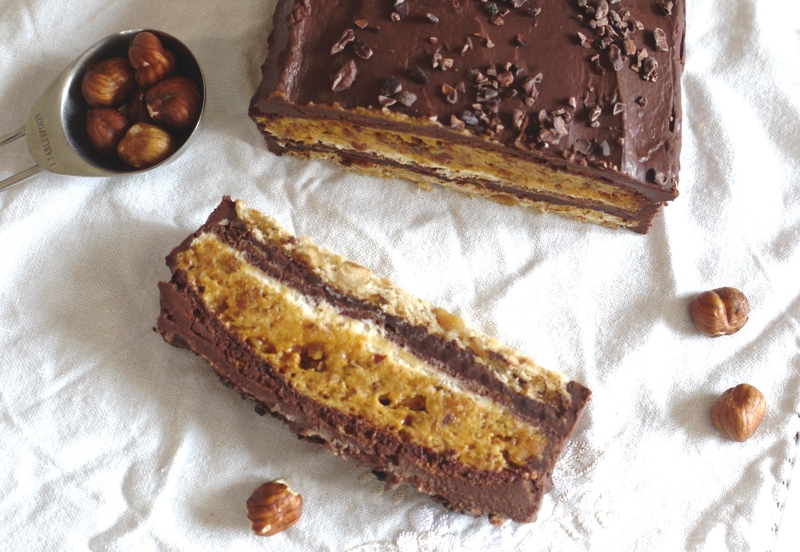 My understanding is that the four layers, rectangular shape, praline cream and some sort of ganache or buttercream are what make the dish a marjolaine, but you could replace the meringue with a very light sponge, stir coffee through your cream, add different types of nuts or a splash of stronger liqueur. It’s also fairly forgiving in terms of presentation as the whole thing is iced, meaning you can cover any cracks or flaws. When you look at the list of ingredients below, and read through the various stages, you might be tempted to overlook this French fancy for something simpler, quicker and more instantly rewarding. Please don’t. I promise that once you’ve made – and tasted – a marjolaine, things will never be quite the same again. Grease and line two non stick baking trays. Preheat the oven 180 degrees C.
Whip the egg whites until soft peaks form. Combine the sugar, corn flour and salt. Increase the speed on your mixer and add the cornflour and sugar mixture one spoon at a time until stiff peaks form. Divide the batter into two bowls. Sprinkle the chopped hazelnuts into one bowl and the cocoa into another then fold both gently to combine. Spread the hazelnut mixture onto one tray to form a rectangle approx. 30cm long and 22cm wide. Do the same with your cocoa meringue on the second tray. Bake for 20-25 minutes until light golden brown then leave to cool completely. You can store these in cling film for up to 3 days. Line a baking tray with a silicone baking mat. Spread the sugar on the bottom of a heavy bottomed saucepan and cook over a medium heat until it begins to melt around the edges. Drag the melting sugar into the centre of the pan with a heatproof spatula then stir gently until all the sugar is melted. Cook until the liquid is a deep amber colour, then remove from the heat and stir in the chopped almonds. Warm the crème fraîche in a small saucepan until it just begins to boil. Remove from the heat and add your chopped chocolate. Leave for a minute or so, then stir the mixture completely til smooth. It’s important to chop the chocolate nice and fine and to have the crème fraîche nice and hot or the ganache could split. Set aside to cool. In a stand mixer fitted with a whip attachment, whip the crème fraîche, cream, sugar and vanilla on medium speed until glossy, stiff but still shiny. You don’t want to overbeat. Weigh 180g of your cream mixture into a bowl and stir through your blitzed praline. Set aside. For the vanilla cream, add the Frangelico to your remaining crème fraîche and cream mixture and stir to combine. Set aside. Slice both your meringues in half lengthways so you have four rectangles of approx. 30cm long by 11cm wide. Cover a tray with cling film and place one hazelnut meringue on top. Spread 180ml of the chocolate ganache onto the meringue, then top with a chocolate meringue. Put the remaining chocolate ganache in the fridge for the next day. Spread over all the vanilla cream then top with a hazelnut meringue. Spread over all the praline cream then top with the last chocolate meringue. Wrap the cling film round the whole thing nice and tight and pop in the fridge overnight to set. The next day get your ganache out the fridge and warm slightly until it has a spreadable consistency. Remove the marjolaine from the fridge, take it out of its cling film wrapping and place on the plate or board you want to serve it on. Spread the top and sides with your ganache then return to the fridge to set. The marjolaine is best served at room temperature. To get the neatest slices possible, use a serrated knife, running the blade under hot water between each slice for a super smooth finish. Enjoy on its own, or with a small scoop of vanilla or coffee ice cream. Is it bad that I want this for breakfast now? And lunch and dinner? It looks amazing. Truly amazing. Btw, you need to get a commission from Frangelico. I’ve always wondered about it and since reading your blog, I’ve actually thought about buying a bottle! I don’t think I have ever eaten anything similar, I love that it has so many different layers! A masterpiece. Looks utterly decadent and divine. Love love love it. That is so impressive and inventive – well done you. Miss South – haha, yep, maybe I should get commission. I wouldn’t really drink it on it’s own, only put it in desserts, so having to come up with ways to use up the bottle! Skye – why thank you! Jereme’s Kitchen – thank you. Tara – ah, thank you. It doesn’t look like much before you cut into it, but when you do the layers are so inviting. Reading this made me drool! Wow – that looks amazing – Clever girl! Youre right – I am a little nervous by all the stages and work … but is there any chance you fancy making it and coming round to MINE for dinner soon?!?!? I think tiramisu might have something to say about that! Either way, this looks jolly delicious! I’ve never heard of or had one of these but I really ought to rectify that – it’s so pretty! Arwa – haha, glad you like it! Em – haha, it would be my pleasure! Just found your blog, great recipe. 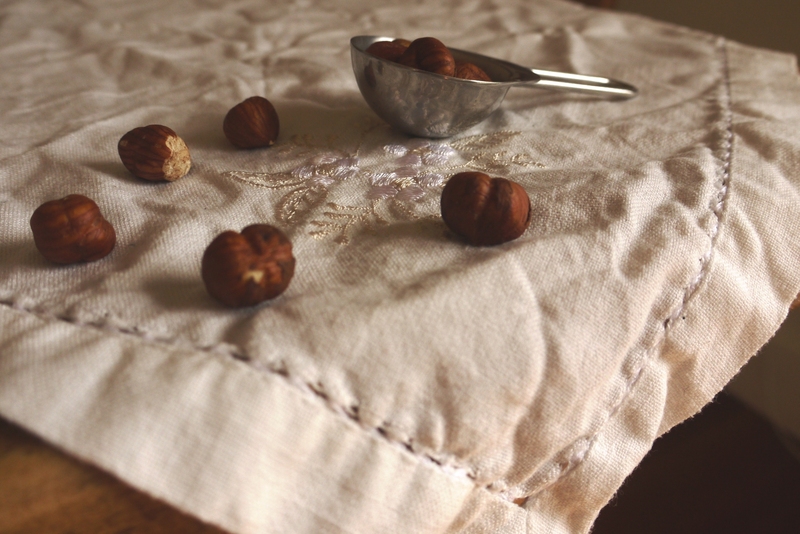 Hazelnuts are one of my favorites! Lovely post, as always, and I *love* your kedgeree, toast and marmalade plate! And this one especially! It looks beauitful. It’s something I overlooked when glazing through that cookbook, but now it’s going on my to make list. I’ve found so many gorgeous French desserts have a lot of components to them but as you say, they can be done ahead of time! Bryan – hazelnuts roasting in the oven is one of my all time favourite smells. Amy – it’s easy to overlook as there’s no accompanying picture (I’m so visual, I like to see what it should look like!) but definitely worth making. Jesica – haha, thank you! Good things do come to those who wait, and this is definitely a good thing….a delicious thing!!! As much as I love simple desserts I find ones that require lots of stages and preparation so rewarding. I would absolutely love a slice of this right now. It truly looks divine! 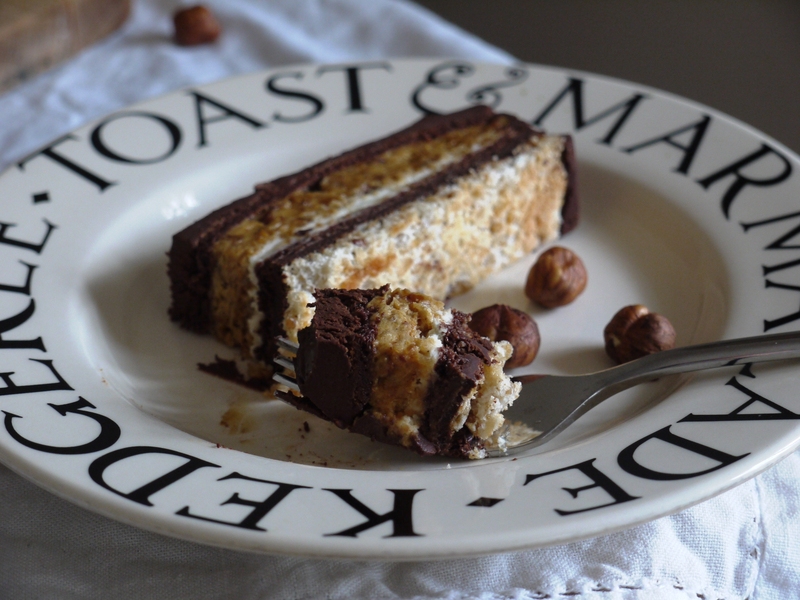 Hazelnut & chocolate … such a good combo … I love this recipe, so tempting !! You can’t go wrong with david Lebovit and Fernand Point!! You’ve sold me. This looks wonderful! Jennifer – they definitely do! I agree, sometimes you bake to satisfy a craving, and sometimes it’s all about the reward of creating something complicated or elegant. 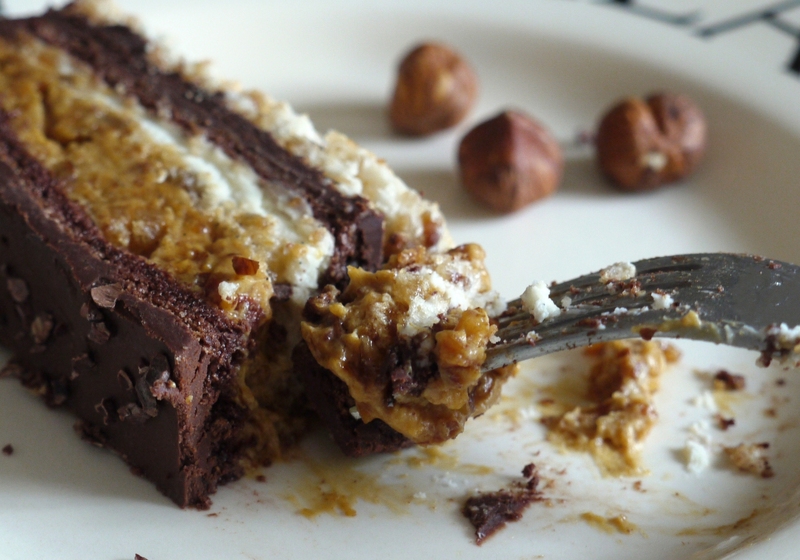 Argone – hazelnut and chocolate is a match made in heaven. Jen – I have to admit I’d never heard of Fernand Point before researching this post…is that really bad?! Lauren – I’m afraid we devoured most of it that evening, then I finished the rest with my boyfriend on the Sunday. If I could send you a slice I would! Having just spent the last week on holiday in the South of France I can attest that the French certainly do make the very very best desserts! This looks truly magnifique! This looks absolutely amazing and really beautiful! I love hazelnuts! I think it’s also the names. everything sounds posher and better in french haha. Beautiful layers 🙂 looks and sounds amazing! And what a cake!! heavenly indeed. Kiran – I promise if you follow the steps, it’s really not that tricky. Anh – thank you 🙂 I’ve been experimenting with my Dad’s camera – much better than the phone camera I was using before! Looks fabulous! good on you for sticking through a long and arduous looking recipe! I know it’s worth it! I am in total agreement with you. It pains me to say it but there just is no one to beat the French when it comes t patisserie, they really are the masters of their art. This looks like such a dream, well worth the effort as the end result would be so memorable not to mention divine! Cake Brain – it was 100% worth it! Laura – thank you. I’m definitely going to make it again – maybe with some sort of coffee and chocolate combination. Love this, it’s really pretty and such a cute name too! This looks amazing and beautiful and I have no doubt that if I tried to make it would end up with me sitting on the floor in tears surrounded by broken bits of meringue and chocolate in my hair. I don’t do delicate or high maintenance recipes well. Oh this might make a great birthday cake for my boyfriend, I bookmarked this recipe. Thanks for sharing. Lucas – I reckon you should give it a try…you might surprise yourself! I recently came across your blog and decided to try this as the first recipe. I live in India and we don’t get creme fraiche here, so I made my homemade version of it. I also don’t have as big an oven to be able to bake according to the proportions here. To cut a long story short, I was determined to conquer it so I made do with what I do have and could get. And, it turned out wonderful!! It didn’t look anywhere as close to good as yours done, but the taste was something to fall in love with, even if I say so myself. Everyone who had it really liked it. In fact, my boyfriend said it was the best thing I had baked thus far. Thank you for a great recipe and an even more enjoyable experience making it.